Those of us that own Janome sewing machines know how amazing their products are. With all metal interiors and superior functions such as Acufeed and their easy drop-in-bobbin system, their machines are built to last. Pink Castle Fabrics is determined to sell our customers what we believe is only the best when it comes to your sewing machines. What you may not know about Janome is their dedication to helping those that need it. In the past, Janome has created special machines with specific charities in mind. 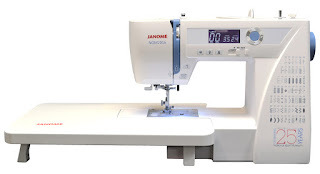 In the past, Janome has sponsored Women's Heart Disease awareness, Breast Cancer research, and the American Sewing Guild all through sewing machine sales. We're proud to be an authorized dealer of this brand of sewing machines because of their efforts to help those in need. Here at Pink Castle Fabrics, we currently have two machines that, when purchased, part of the proceeds go towards a charitable cause: The NQM-2016 and the NPCF-50. Benefiting the National Quilt Museum in the NQM-2016. Janome has already raised over $15,000 for the National Quilt Museum this year with this sewing machine! The money donated by Janome goes towards maintaining exhibits, sponsoring classes for youngsters, among other amazing feats! This machine is the perfect travel or beginner’s machine! Pink Castle Fabrics' price for the NQM-2016 is only $719.00! The Janome NQM-2016 is only available through December 2016. Quantities are limited, so order yours today! The NPCF-50 donates its proceeds to the Nation Pediatric Cancer Foundation. 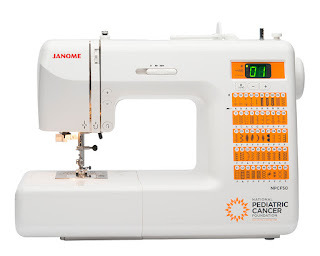 The National Pediatric Cancer Foundation was founded in Florida by a Janome dealer, making this philanthropy very near and dear to our hearts in the Janome Community. 2016 marks the 25th year since the Foundation’s founding. The NPCF-50’s bright and happy orange color symbolizes the National Pediatric Cancer Foundation’s Sunshine Project. This project brings together the nation’s best medical staff to find cures and increase the survival rate of those diagnosed with all types of cancer as children. You can read more about their efforts on their website here. When you purchase this machine, you’re helping to fuel the research and treatment of so many children throughout the country, and to recognize that, you’ll receive not only an amazing sewing machine, but also a quaint lapel pin and a special letter about what your contribution has done for these children in need. Pink Castle Fabrics' price for the NPCF-50 is only $549.00! The NPCF-50 sewing machine is perfect for beginners of all ages and the perfect size to be a travel machine or store away easily when not being used! It’s vastly versatile, allowing you to use it for garment sewing, quilting, or home decor. It's compact, so it stores away easily and works beautifully as a travel machine weighing in at just over 18 pounds! Here at Pink Castle Fabrics, we take pride in the fact that Janome dedicates so much time, effort, and money into giving back to the world. Whenever you sew on your new machine, you’ll think about the good you have personally done for society. If you have any more questions on any of our Janome products, please e-mail Molly@PinkCastleFabrics.com for more assistance.